Such a nice finding I made three months ago, about this beautiful book presenting great illustrations by Anaïs Groisy. Curious to know more about her trip to Nepal and how she came to draw the artisans at work, visited the place and so on…So we came to schedule a meeting last Saturday via a Skype call. First question, why to have chosen the destination of Nepal? I studied in England where I met Bishwesh, my Nepalese roomate, who become afterward my brother-in-law! We planned a trip to Nepal in October, 2015 for two weeks with my parents, Bishwesh, my sister and their son. When we came to know about the earthquake of April 25th, we were a bit hesitating to come. Our flights tickets had been booked two weeks before but we ended up maintaining our journey. How do you prepare or develop a travel diary? The travel diary is a mix of my feeling about the places I visited, the people I meet. Before I arrive in the country, I actually do not make any research on it. It is usually my sister, being an expert in tourism, who will plan and choose the places that we will visit. I usually like to draw on the spot, I have a notebook that follows me everywhere. I make sketches either at home or directly « live » in front of the monument or the place that I like to replicate. If I feel inspired by the place, by the people, then I feel like drawing and I will start the travel diary; otherwise I don’t force myself to do it. The aim is simply to keep memories of what you love about the country. When I draw a sketch on the spot, locals stop and with the helps of signs and smiles you get to communicate. I like to share what I do with the locals, this is what I enjoy the most. 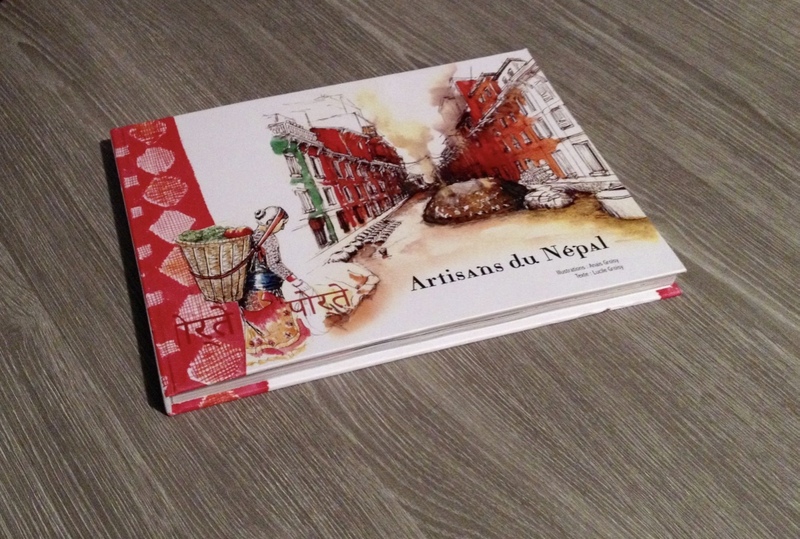 How did the theme « Nepalese artisans » came to you? After spending two days in the Kathmandu Valley, I found a common point. In every place visited, I have met craftsmen. From knitting to pottery, from wooden sculpture to weaving … This theme was therefore obvious and crafts are also rich and linked to culture, so it made the theme even more interesting. It was also a pleasure to walk the little streets and places with Bishwesh, an excellent interpreter with the craftsmen. I was able to have a great understanding of the craft, its origin and its technique. It was a very nice experience. Dish: The dhal bhat which presents a multitude of small dishes which comes with the rice. Without knowing it, I had the chance to eat delicious fried goat lungs; this dish is much more original than the dhal bhat! Monument: Difficult to choose one; I will say the Patan Durbar Square and Swayambhunath’s temple, where I had the chance to meet many artisans, surrounded by a few monkeys! Smell: Curcumin; because I was a little sick at the beginning of my stay, Bishwesh’s mother gave me hot water mixed with curcumin to drink. The smell of this spice is now engraved in my memory! How did the love for travel diaries start? 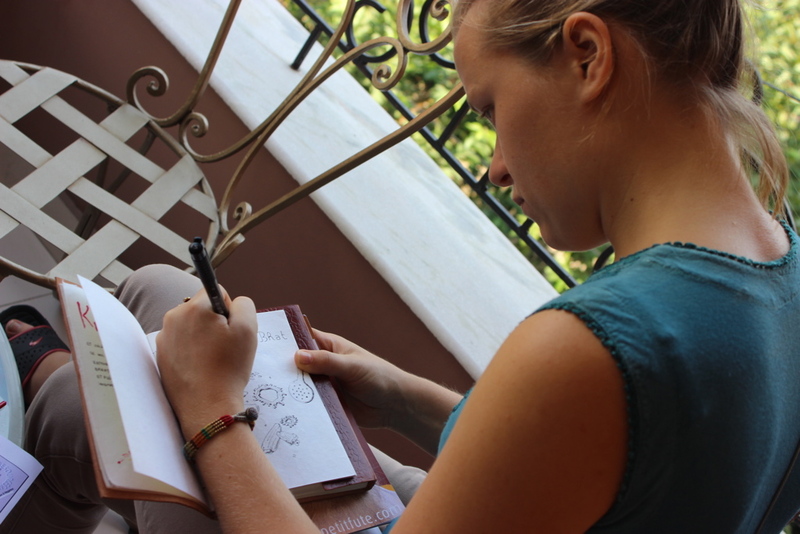 I started developing travel diaries when I was 14, with the country of Sicily. I made a sketch on daily basis according to my impressions. Then, I really started liking it until the point that I continued this habit for my travels in Europe, during my Art studies and for work in the countries like Japan and India. Recently I went to Sri Lanka where I enjoyed seeing the beautiful nature, the warm welcome of the Sri Lankan and its spirituality. I would like to warmly thank Anaïs for her time. I am delighted to meet her and discover the stories behind the Travel Diaries! Congratulations for her great work and presenting the special craftsmen of Nepal and the rich Nepalese culture! Find more of these illustrations on her website and her Facebook page.